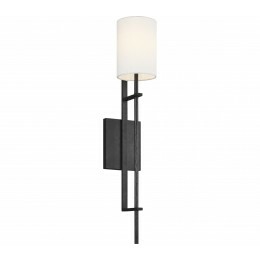 The Feiss Ansley one light wall sconce in Aged Iron offers shadow-free lighting in your powder room, spa, or master bath room. The epitome of Mountain Luxe, Ansley has a historical, raw material look with sturdy framing. Its New Aged Iron finish gives it an artisanal, hard-forged feel. The assortment includes: 12-Light Chandelier, 8-Light Chandelier, 8-Light Linear, one-light sconce and vanity silhouettes.